Ask anyone who's into toy collecting these days and they'll tell you that one of the most talked about toy lines (perhaps even second only to Marvel Legends) is Mattel's new baby: DC Superheroes. Pretty much what this line is, is Mattel's attempt to a) answer the fans/collectors' plea for a Marvel Legends-style line and b) tap into some of ToyBiz's "lighting-in-a-bottle" buzz they apparently have with the popular Marvel line. The line offers Batman and Superman characters with around 20 points of articulation. 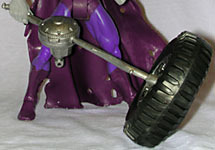 The first series took a little heat as it offered two figures previously only available outside of the US and two figures previously released with only paint and slight sculpt modifications. The real success of the line, at least for Mattel, was that it was the first time the entire assortment was "comic accurate," offered only one Batman and THREE villains, which seems to be more or less the plan for the entire line. Series Two is really where the line starts to get great - it's Superman-based and offers four totally brand-new figures! Running around one day last week, I decided to check a local "Collector's Store" (aka "scalper store") which seems to have some kind of connection to Mattel. They had lots all of the Snake Men He-Man series when no one else around carried them (still do, in fact, due to prices as high as $35 for certain figures), and tend to get JLU stuff in earlier than most stores. So I was only half surprised when they had all of the Superman series when I went in. Since they were priced at $10 each, I decided to break my "don't support scalpers" rule for the Bizarro figure. I've been dying for him, and when I got up to the counter, I saw something amazing between the registers. It was a variant Bizarro figure. Let me just say I couldn't begin to believe what I was looking at – the rumors are true! I had just been to WWLA the previous weekend and they had a bunch of DC Superheroes figures on display, but no Bizarro variant! I asked to look at it and checked it out as best I could and was convinced this thing was legit! I asked the guy how much it was, $35 and he said they only had three come in from 10 cases. Thus, I impulse-bought the coolest, surprise variant a Bizarro fan could ever find! For starters, I love the regular Bizarro (but really, how "regular" could Bizarro really be?) 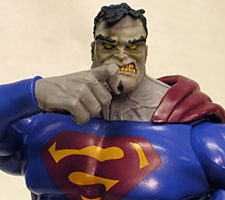 but I was kinda disappointed that his costume colors weren't more purplish – my preferred look for Bizarro. Well, this figure makes up for it spades! Its damn perfect for coloring and really just accentuates the difference between Superman and Bizarro #1. I can't wait to put him next to the Superman! 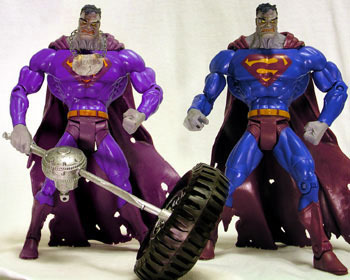 On the subject of sculpt and articulation, there are no sculptural differences between Bizarro #1 and Bizarro, and they have the same articulation – ankles, knees, thighs, hinge-hips on a T-crotch, waist, hinge torso, balljoint shoulders, biceps, elbows, wrists and balljointed head. All told 21 points. "Love" does not adequately express how I feel about this figure. It's just a simple repaint with one added accessory, but it is so much more than that – it's basically a perfect Bizarro figure and it begs the question, why wasn't this the regular version? Who knows, it is Mattel after all – "the more things change, the more they stay the same" I guess. So overall, this is the Bizarro figure for any collection. A far superior color scheme, an awesome accessory... this is an awesome figure and in one way, at least, Mattel has beaten ToyBiz at their own game - this variant is going to the troubles people had finding ML variants and Lord of the Rings figures to shame. Goodbye, YDD syndrome; hello Purple Bizarro syndrome. Okay, if you don't get it by now, go back and read the first letter of each paragraph. Then come back here for the real story. If you want a muscle-y, hulk-ish Bizarro, Mattel's really is the one for you. 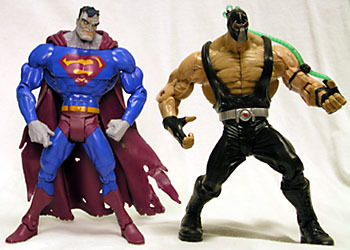 Of the five Bizarro action figures, this is the only that has clearly different proportions from Superman - however, they're all above the waist. 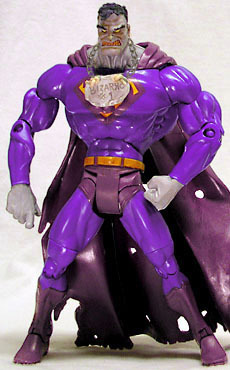 Bizarro has a very large chest and is all over just more rotund, defined and vein-y that his un-bizarre counterpart. But this is Mattel, so we did have to expect some form of cheapery in this series of all-new figures: that cheapery takes form in the southern half of the Super Clone Brothers. Bizarro and Superman share the same sculpt from their feet all the way up to their mid-torso joint. Does it hinder the figures' coolness? No, not really, but it does hold this Bizarro back from bizarre perfection. The very ample 21 points of articulation (ankles, knees, thighs, hinge-hips on a T-crotch, waist, hinge torso, ball-joint shoulders, biceps, elbows, wrists and ball-jointed head) actually work quite well and have great play and pose range. 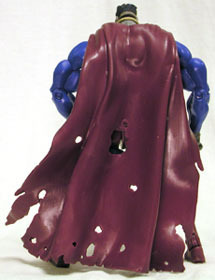 Bizarro's cape is rather big, thick and riddled with holes, not unlike a syphilitic sailor. It's nice because it's slightly longer than Bizarro's feet so it can be used as a sort of prop to support certain poses. However, it can also get in the way, especially folding back the torso for flying pose. Bizarro's right hand also presents issues, since it's sculpted with the index finger in awkward almost "trigger" position. Of course, this looks fine when he's dragging about his godless axle/tire accessory, but when that accessory is removed... the best possible pose would be called "Der Inquisitivo." The head sports a really nice sculpt. It's full of detail and failed-clone angst. A particularly cool touch is that while Superman suffers the iconic curl on his forehead, Bizarro's hair sticks out over his forehead and brow. It's just a great touch that adds depth, character and uniqueness to the figure. Paint is also pretty solid on the figure. The "S" is backwards, as it should be, and is just painted on, not sculpted. The skin is a nice shade of gray with tan-ish highlights on the face. The hair has some dark blue highlights, to boot. The boots, "underwear" and cape as a good shade of maroon, however the blue is just more than a blander blue than is on Superman, as opposed to the preferred purplish color from the modern comics and the DC Direct figure - yes, sad to say, there is no purple variant of this figure. Let's spell this out plainly: if you are a company, and you are planning on making a Bizarro figure, make the damn thing purple. Fans want purple. Deep breath, deep breath. It's okay. Back to the review. Basically... buy this figure. The price may be a little high but for a comicbook (a reprint of Superman #181, an Ed McGuiness-drawn one-shot of Bizarro and Superman waking up in each other's bodies), a big accessory and this really cool figure, but it's not too bad. I definitely recommend picking this lil' feller up! Which Bizarro version am not your unfavorite? Don't tell us on our message board, the Loafing Lounge.